The Saryk are one of the original 23 tribes of the Oghuz. In the early 19th century they defeated the Salor and for a short period of time were the preeminent Turkmen tribe until losing to the Tekke. First phase has a soft clear orange red as the field color no silk or cotton pile Turkish knots and a soft apricot color in the Gul. 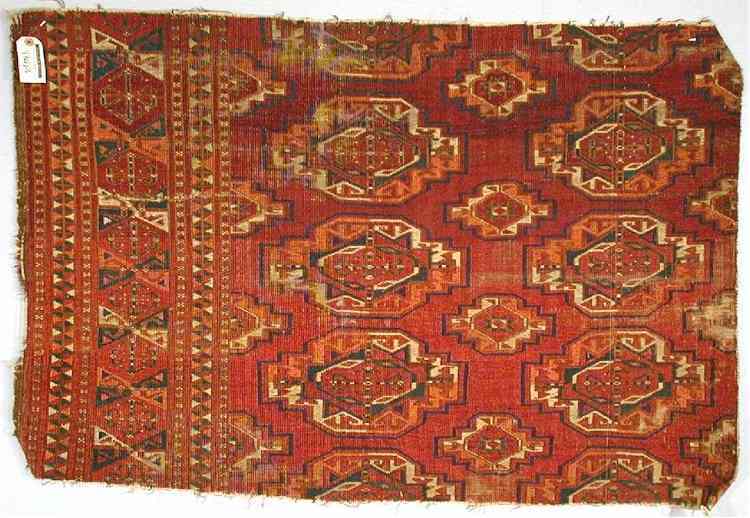 Second Phase rugs often use silk and cotton in the pile, insect dyes and the main field red tends more to a blue or a brown red than the orange red of the first phase. 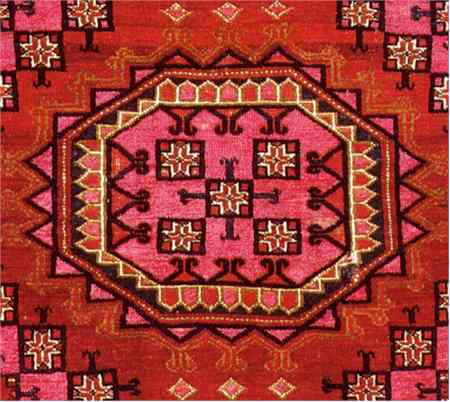 Gul quadrants use a color more orange than the apricot of the First Phase rugs. 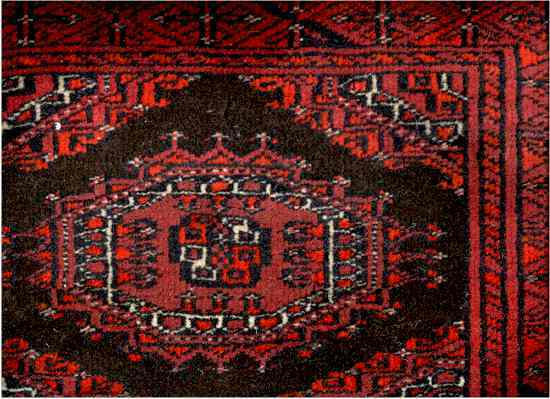 Both Turkish and Persian knotting are seen in Second Phase. Third Phase: Colors are darker and brown and purple brown are seen as field colors. At worst there is garish overuse of insect dyed silk and cotton as white. 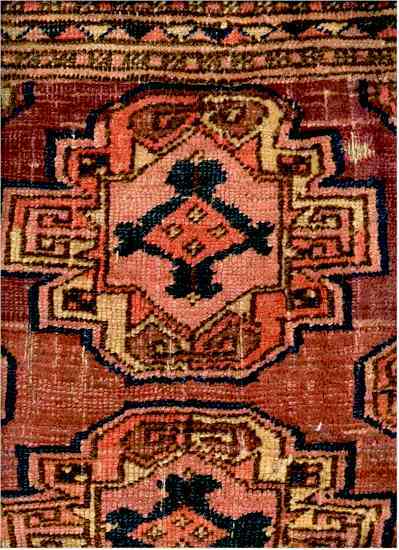 Rugs use Turkish knots. When the Tekke drove the Saryk out of the Merv Oasis the Saryk moved south under the protection of the Jamshidi who controlled the area north of Heart for the governor of Heart. The area was Choi north of Badghis between the Hari-rud and the Murghab River. Choi mean desert rut not sand desert, Choi was an area suitable for herding but not nearly as fertile as the land the Jamshidi lived on. This allowed the Saryk to flee “south of the border” so to speak and gave the additional safeguard of being under the protection of the government of Herat which was under the authority of the King of Kabul and his British allies. This was potent protection since the British came in and exerted their authority over Herat in 1855-56. Moving to Choi was a drastic change for the Saryk. Besides Farming and herding the Saryk gained wealth by slaving and weaving. The Russians and the British effectively ended the slaving. Weaving dramatically decreased in importance but the nature of living in Choi. The Treaty of Paris 1856 which ended the Afghan-Persian War severely curtailed trade between Afghanistan and Persia. 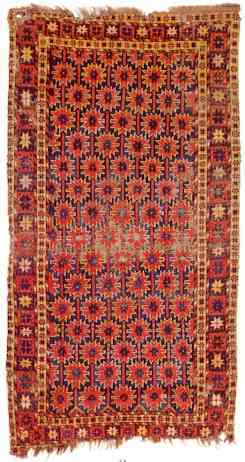 Without the Persian market and separated from the Central Asian markets by their enemy the Tekke, weaving for commerce declined drastically. Additionally without the rich farms of Merv and the income from slaving the Saryk were not in a position for extravagant weaving for personal use. From all this we see the decline of the Saryk Weaving from the earlier heights to the dark coarse rugs that I call the Third Phase. Saryk Yolami Fragments Turkmenistan, Afghanistan, and the Iran. Mostly Turkmenistan. Size: Bags rugs and carpets. Structure: 1st and 3rd phase Symmetrical knot.2nd phase may be Asymmetric open left. 100 to 250 KPSI. No depression to slight warp depression in older rugs and deeper depression increasing to deep der on very late rugs. Knots Per Square Inch. Densities recorded were 108 (Lot 123), 112 (Grote-Hasenbalg, Plate 85, est. ), 162 (Jones/Schürmann), 200-250 (Thacher but probably 125), 134 (Herrmann VI), 135 (Lot 133), and 144 (Franses). O'Bannon, The Saryq Main Carpet. Cotton and Silk. 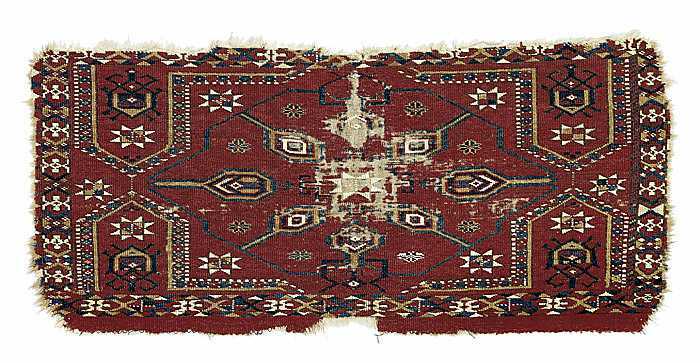 The oldest rugs are believed to have neither. 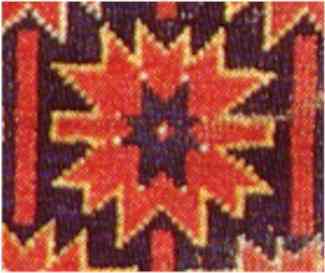 Silk and, occasionally, cotton are found in mid-century weavings. 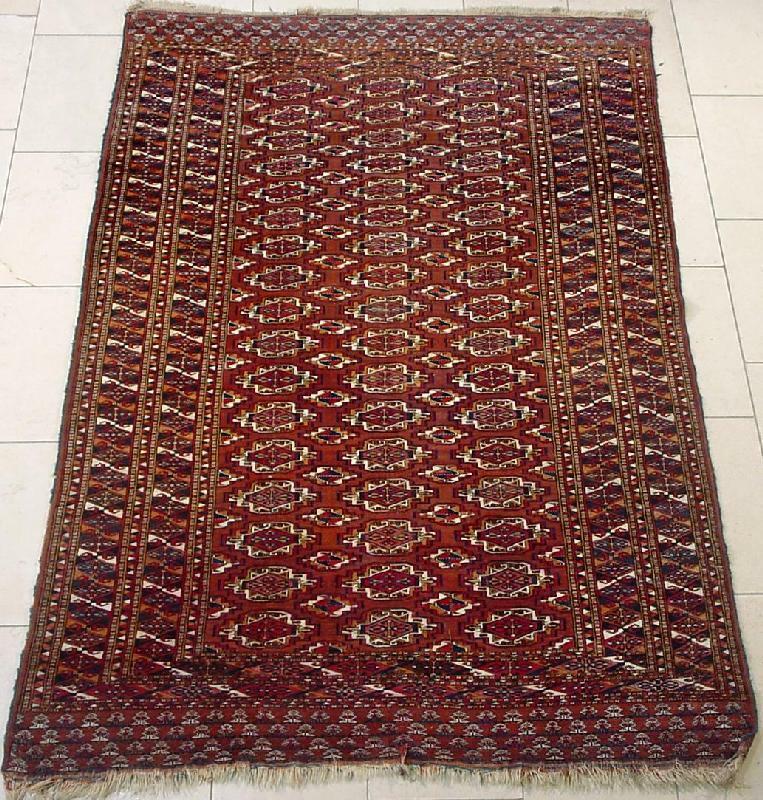 Their use increases dramatically late in the century and in early 20th century rugs. 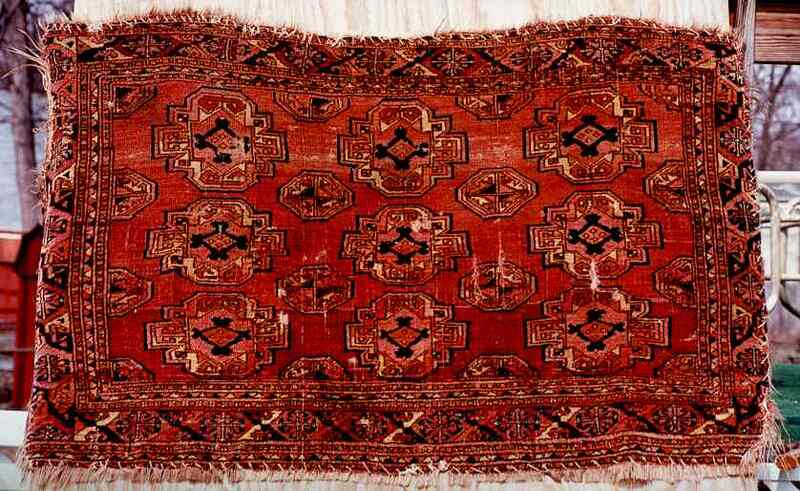 Neither are common in mid-20th century Saryq rugs from Afghanistan. O'Bannon, The Saryq Main Carpet. Ends: Most often weft faced plain weave. Handle: Light - medium. 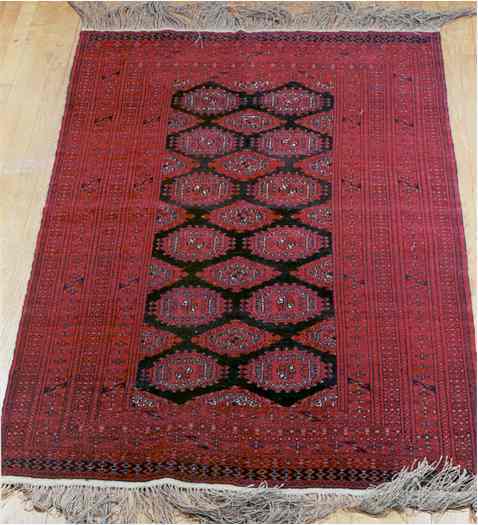 later rugs get a progressively heavier handle as warp depression increases. This Saryk decorative trapping , here for lack of available radio carbon dating carefully dated, could be one the oldest, us received Turkmen work. The Kedschebe sample is differently conceived than otherwise, with a large, flat oval in the Feldmitte, whose ornamentations approach radially on a star-filled, hook-occupied stages polygon in the center. White cotton portions accent the sample. 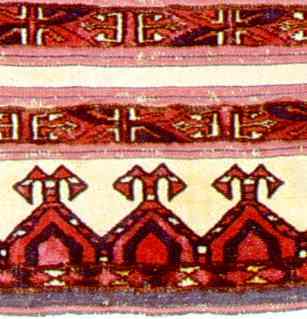 A large nine Gül Tschowal of the Kizilayak Turkmenen with light red field, chemche secondary güls and interesting Kotschak motives as border design. The Elem is decorated with house-like Giebel design. - Sides and upper conclusion, down remainders of the Kelim again back tapes received. Light wear. 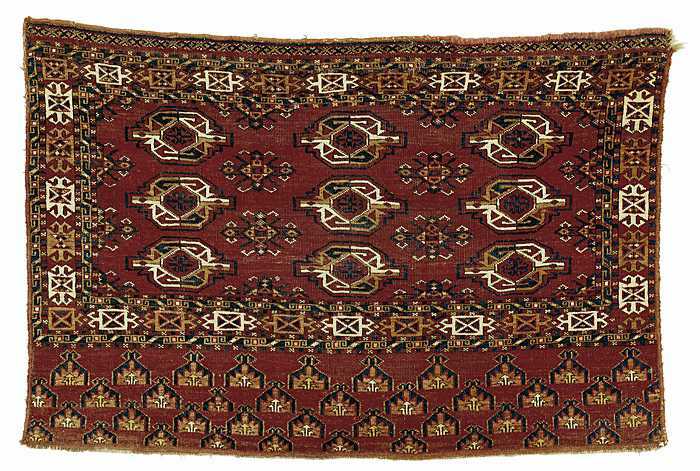 With a complex grid design, symmetrical knotting, and its characteristic border this rare bagface is the work of a Saryk weaver. Closely related is a piece in the Leningrad Museum. Very important collector’s item. – Upper corners slightly damaged, in overall very good condition. 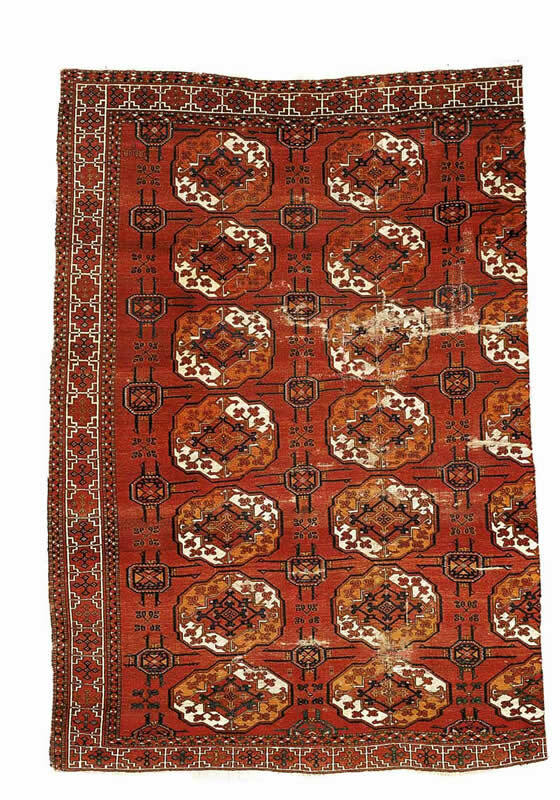 Saryk Rug. Afghanistan late 20th century. 5 foot 9 inch by 4 foot. Structure: Symmetrical knot pulled left. 8 knots per horizontal inch and 12 knots per vertical inch. 106 per square inch (1643 per square decimeter). Deeply depressed. Weft: 2 shots 2 ply black wool. Ends: 3/4 inch plain weave, Warp fringe. Selvages: 1 warp set wrapped in black wool. Further Notes: New rug, well made, good dyes, great color. No problems that I can spot. 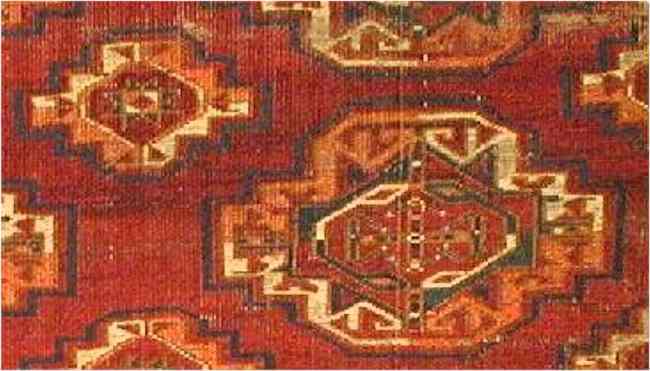 Turreted Gul pieces were originally attributed to the Salor but as Rug scholarship advanced it became obvious that turreted Gul were attributable to the Salor, the Saryk, and to the Tekke. It has been suggested that Saryk only started weaving them after they defeated the Salor but Turkmen Expert James Allen feels that while rare there are Turreted Gul Saryks in all three phases and that the Saryks have always woven that design. The Saryk are one of the original 23 tribes of the Oghuz Confederation. In the early 19th century they defeated the Salor and for a short period of time were the preeminent Turkmen tribe until losing their primary position to the Tekke. This rug is an anomaly. It does not fit clearly into the conventional wisdom of our understanding of Saryk weaving. I should make up some story that this is 400 years old and a "Museum" piece. However life is too short to try to snooker you with exaggerated claims so I will call this a late 19th century anomaly. Structure: Symmetrical knot.9 knots per horizontal inch and 12 knots per vertical inch. 108 per square inch (1674 per square decimeter). Slightly depressed. Weft: 2 shots 2 ply wool, tan. Further Notes: Fragmentary with condition problems. The bluish red is insect based natural dye (caraminic acid) and the light red is most likely Azo, the blue is natural indigo, and the ivory and brown are natural as well. There is transference of the Azo like dye into lighter areas. The knot ratio is 9 to 12 which points to an early attribution. The archaic drawing and wide Gul spacing points to an early attribution. The color points towards an early attribution. The occasional use of offset field knotting points towards an early attribution. Note the Purple reddish brown color. John Howe has suggested that purple wool comes from Purple Karakul Sheep. This same fellow that thinks green wool comes from green sheep. Needless to say the dye tests indicated that this wool was dyed. Condition: Overall wear, heavy in small areas. The quatrefoil interiors of the principal Sary gols and the eight-pointed star centers of the minor chuval guls are both quite unusual. 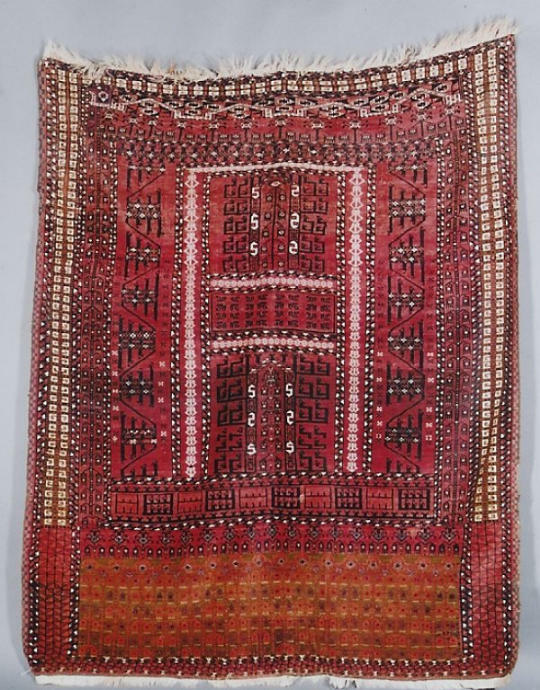 A Kejebe is a bridal rug. 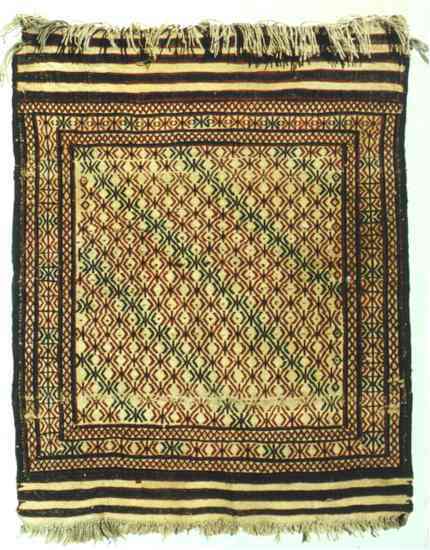 This one was made by Saryks in Northern Afghanistan. The Saryks are a Turkmen people who historically inhabit Northern Afghanistan and Turkistan. The Saryks moved into Northern Afghanistan after losing prime oasis land to the Tekke. This Kejebe is for an average person rather than a member of the tribal elite. Northern Afghanistan, late 19th century or turn of the century. 40 inches by 51 inch (not including fringe). Structure: Overlay, underlay brocading with varying float sequences on a balanced plain weave ground. Weft: 2 ply Wool, 2 shoots. tan. Selvages: 3 cord wrapped in dark wool. Condition: Used with some wear. Some minor wear to brocading visible in main picture. Structurally in excellent shape for an antique. Provenance: From the collection of an Internationally Known Expert and Connoisseur who wishes to remain anonymous. This is a very nice example of a fairly rare type. The colors in this piece are really nice. 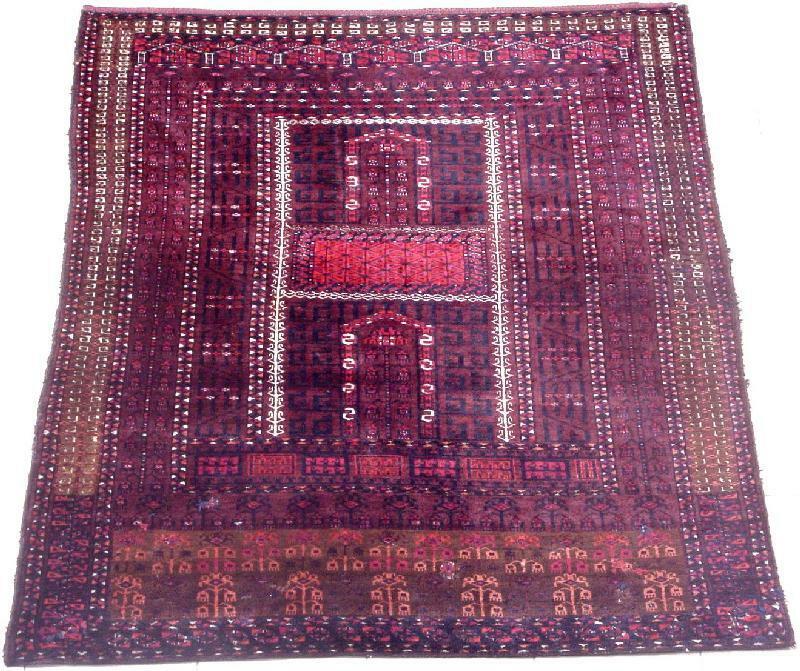 The person I got the piece from is an internationally known expert and Connoisseur who was quite definite in his attribution of 19th century and natural dyes. I have to agree the piece is splendid. It is interesting to note that brocading is all done on the loom. Many people confuse this with embroidery but an easy way to tell is that brocading runs with the wefts but embroidery may be in any direction. 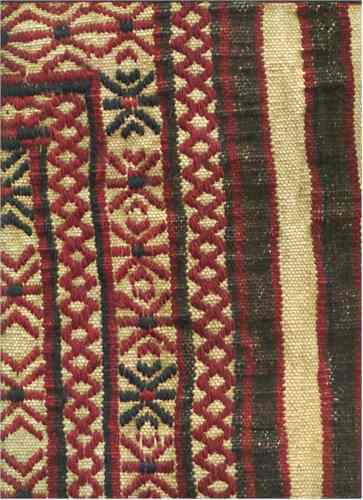 This fragment is the flat-woven part of a Saryk tent band decorated with the typical flowers, followed by a complete tree motif. In good condition. Except for minor damage to the sides, this Yolami fragment is in good condition. Turkmene. Saryk. Um 1900. Zweo Reihen à 10 Sarykgöls auf auberginefarbigem Grund.. 212 x 118cm. Zustand C.
This is a Pende/Saryk ensi. 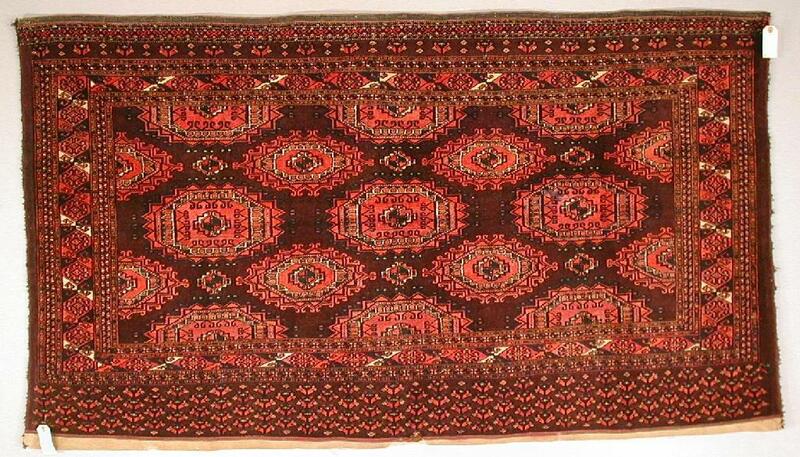 It was woven about 1890 in Turkmenistan and is in very good condition. The size is about 4x6. 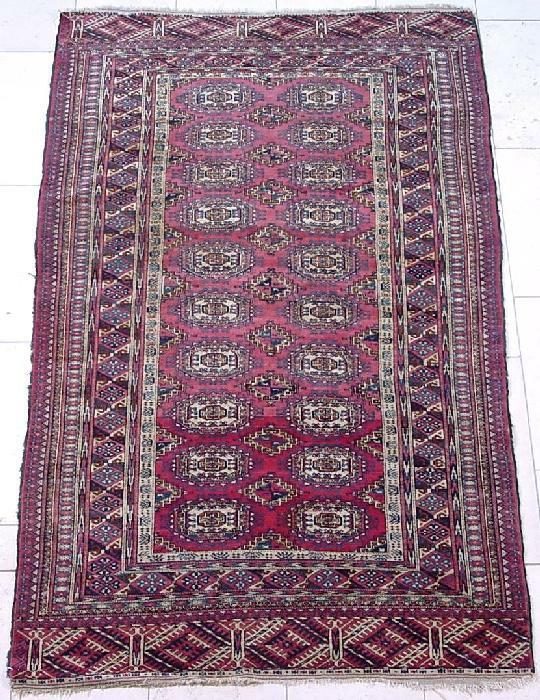 An excellent early Saryk Engsi with beautiful colours and a spacious design. Generally still in good condition; the braided shirazi is preserved at the left side, but missing on the right side; this side shows some quite visible damage. Upper right corner need to be repaired. Both ends slightly reduced; a few low areas. Pile and flatwoven, magenta silk highlights, cotton whites, some fraying to the applied binding, small repair to flatwoven back. Each 3ft.3in. x 5ft.7in. 1m. x 1. 79m. One with small ink stain, both with slight corrosion of cochineal dyed silk. A very handsome pair of Saryk chuvals with extensive use of silk and the white piled in cotton typical of this period. Turkmenistan 18th or 19th century. Partial side borders and end borders, small hole and repaired slits in center. 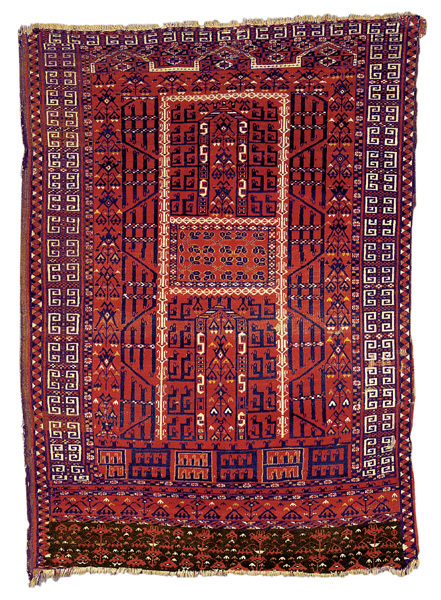 An Ersari Turkmen Rug Turkmenistan 19th century. Holes, bits out of ends, partial side borders, small reweave one corner, reweave in border, several small repairs in border, oxidized browns.